"These are the recipes I make, that my family makes, that my friends have made. 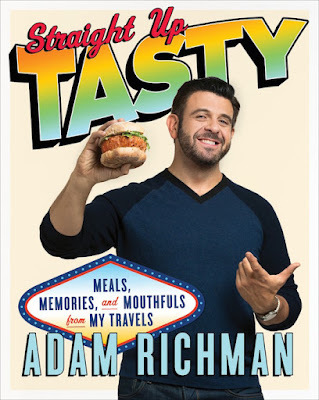 They reflect the flavor combinations, techniques, and ingredients I've picked up on my travels these past few years, and all the wonderful and weird meals I have tried ..."
There are plenty of books written by people who aren't chefs. And to be honest, if you want a book that you'll cook from, a chef-driven restaurant-centric book might not be the best choice. Chefs and restaurants have access to ingredients that the average home cook might not easily find. While I'm perfectly happy to hunt down fancy ingredients for "project" recipes, I cook every single day, and most of those days, I want to make things that are doable. I want to use ingredients I have on hand or that I can find without going to four different stores. While Adam Richman certainly traveled a lot and sampled a lot, the recipes in this book are firmly planted in his kitchen at home. There are recipes for lemon ricotta pancakes, tortilla soup, a whole lot of interesting sandwiches, latkes, grilled shrimp tacos, chicken marsala, and even spaghetti pie. Those are the kinds of foods that most cooks would be comfortable making at home. They're not super fancy, but they're solid. And of course, there are a few twists and turns that you might not expect, like the twice baked sweet potatoes that include some bourbon. Overall, I'm happy with this book. There's not much here that I'm not familiar with - and for some of these I've made my own versions. But I'm always interested in trying someone else's recipes for things I make all the time. I have my eye on those latkes, for sure. I received this book from Blogging for Books at no cost to me.